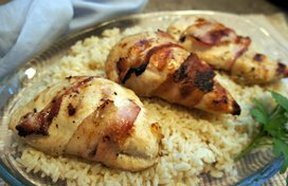 Bacon provides these grilled chicken breasts with an appealing flavor and makes the meat ultra-tender. The flavor of the wine and mustard marinade is a perfect complement to the smoky bacon-wrapped chicken in this easy-to-make chicken recipe. Treat your guests to these mouth-watering grilled chicken breasts at your next backyard barbecue this summer. See how easy it is to grill pineapple to eat on its own or to create scrumptious summer desserts.